A muckraking expose of corporate greenwashing and of the disturbing trend toward U.N.-corporate “partnerships” that give corporations good PR without requiring them to improve their behavior. In the decade between the Rio Earth Summit in 1992 and the Johannesburg World Summit on Sustainable Development in 2002, transnational corporations have increasingly used their resources to deter regulation, suppress opposing voices, and try to buy civil society’s acquiescence with slick PR. But we don’t have to acquiesce, and neither should the U.N. The United Nations may not be perfect, argue Kenny Bruno and Joshua Karliner, but in its principles and structure it has the potential to counter the WTO-a potential it is squandering, say the authors. 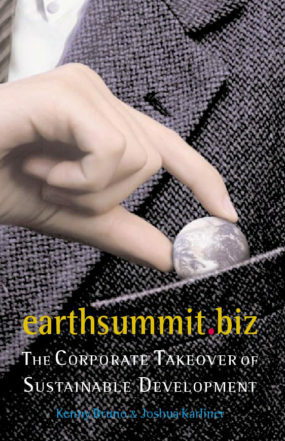 earthsummit.biz exposes the current state of corporate rhetoric vs. corporate reality and debunks the paradigm of transnational “responsibility” and self-regulation. It contains 18 corporate case studies, as well as the complete texts of the U.N.’s toothless Global Compact with corporations, and the Global Compact’s civil society counterpart, the Citizens Compact on the United Nations and Corporations.